Plans have become a staple amongst modelers and enthusiasts over the last decade or so. Kagero has been on company that has embraced this trend with a now rather extensive catalog of books that focus on this aspect of the hobby. 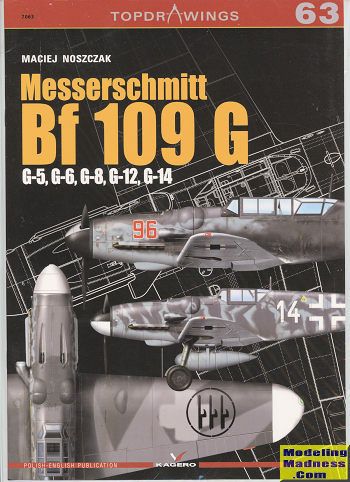 This particular book is their 63rd set of plans in their Top Drawings series and concentrates on some of the most manufactured variants of the Bf-109. The G series was a follow-on to the F model and featured a more powerful DB.605 engine to replace the DB.601 in the previous version. This was as much to handle the increase in weight and equipment that the G model had to deal with. This set covers the later G models with the 13mm guns in the upper cowling and the 20/30mm motor canon. It also includes the two seat trainer, that was a conversion of extant G model airframes. It seems that 1/48 scale is the main scale for modelers and you will find that all of the major plans sections are in this scale. That includes the two very large fold outs that offer upper and lower plan views, ensuring that all aspects of the airframe are fully covered. The 1/72 modeler is not left out as the section that shows the differences between variants is reproduced in this scale. Let us also not forget the superlative and quite large full color profiles that are included, these also being to 1/48 scale. As a bit of a bonus, Kagero has included canopy masks for the 1/48 Tamiya kit. If you are a fan of plans, and many are, this would be a very good one to add to your collection. Review book courtesy of the fine folks at www.casematepublishing.com. You can get this one at this link.